Restaurant longevity is an amazing thing. Most restaurants have about a ten year lifespan, if you average out the start-ups that don’t survive the first year with the standards that keep on going. 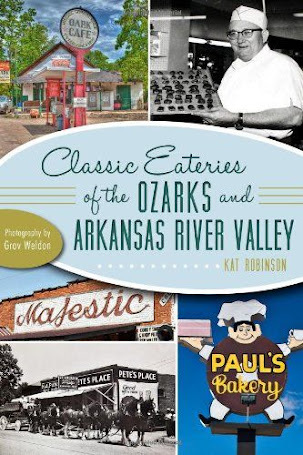 Longtime restaurants from my childhood such as The Shack, John Barleycorn’s and Casa Bonita are long gone… others like Brown’s Country Store and Restaurant and the Ozark Mountain Smokehouse have seen drops in quality or popularity. 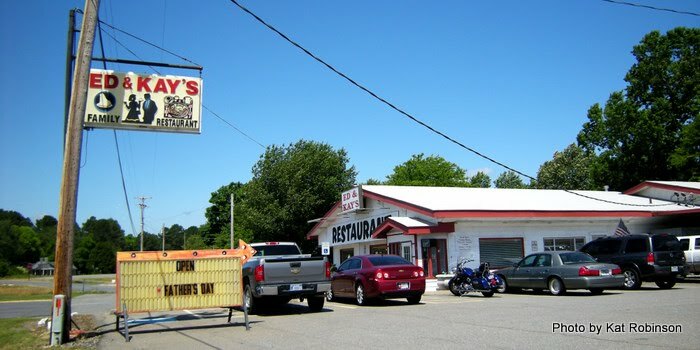 But for more than 50 years now, Ed and Kay’s has been serving up hot breakfasts, filling lunches and great pies in Benton. 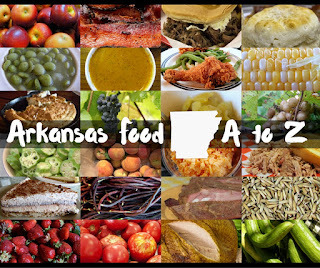 It’s been in the southernmost Benton curve of I-30 that I can’t remember it not being there (well, I’m not over 50, so that makes sense) and I’ve seen a lot of good meals there. I’ve also had a great deal of fun there. Years ago, back when I was a television producer, we sent our morning show down to the shop. I can quite clearly recall Kay Diemer telling tales to B.J. 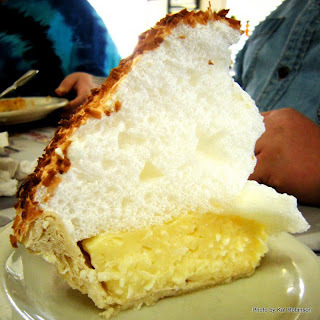 Sams, and how one of the pie ladies showed Robyn Richardson how to make that fabulous meringue. I also remember she licked the meringue off a spatula… but I won’t share with you the reaction of a certain pair of television directors over that particular activity. Pie’s what convinced me to send the show down there in the first place. 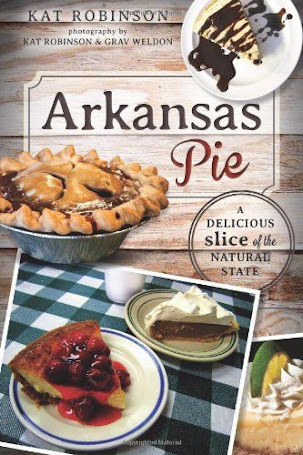 You’d be hard-pressed to find a taller pie in the state of Arkansas. The meringue is piled on thick and richly on coconut and chocolate meringue pies. 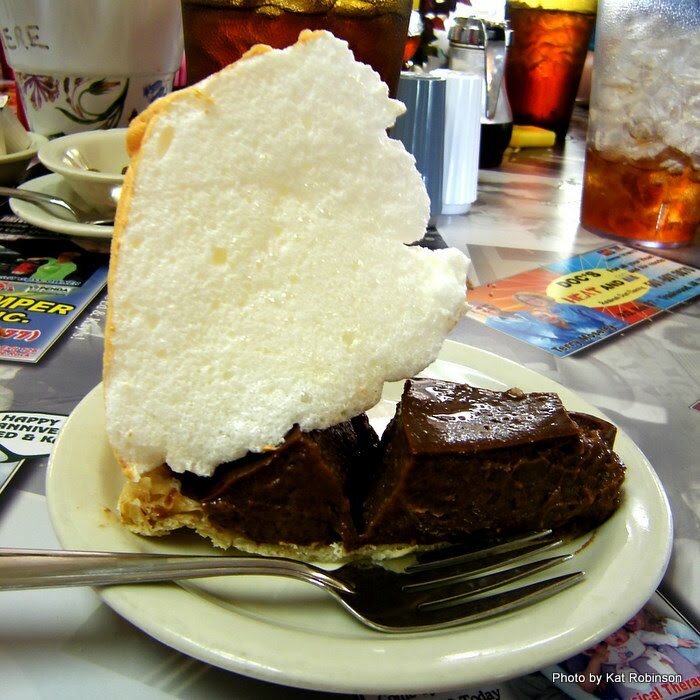 They’ve become so famous, some people only know Ed and Kay’s as “the Mile High Pie shop.” And I can see why they say that. A little further down in this article I’ll tell you why I like the Mile High Pies, but why they’re not my favorite pies in the restaurant. I like going to Ed and Kay’s for breakfast. I’ve had a great number of the breakfasts offered there, but the best one I have ever had was the one I shared with seven of my friends. We were all about to head down to Louisiana for the wedding of two of our friends. Everyone ordered something different. 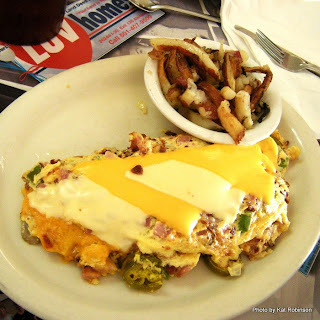 My friend Terri ordered the Kitchen Sink Omelet, just for the heck of it. It’s not really called that, but it might as well be. It’s listed as “Any or All” under the omelet section of the menu, and it’s $9.80. It includes (if you want it all) ham, bacon and sausage; Cheddar, Pepper Jack, American and Swiss cheeses; onions, green bell peppers, black olives, tomatoes, mushrooms and jalapenos. It’s served up with a bowl of cream gravy, fried potatoes and a choice of a pancake, toast or biscuit. It is a remarkably huge and colorful meal. She didn’t finish it. Her husband didn’t finish it, either. It’s just massive. Me? When I go for breakfast I usually go for the Chicken Fried Steak combo breakfast ($7.80 with two eggs). It’s a nice crispy piece of tenderized beef covered in cream gravy. 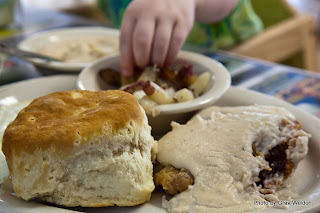 I usually get mine with a little extra gravy on the side -- the made-from-scratch cream gravy is great on one of Ed & Kay’s fluffy biscuits; I usually take home a biscuit half with gravy to savor later. What never does make it home are the fried potatoes. 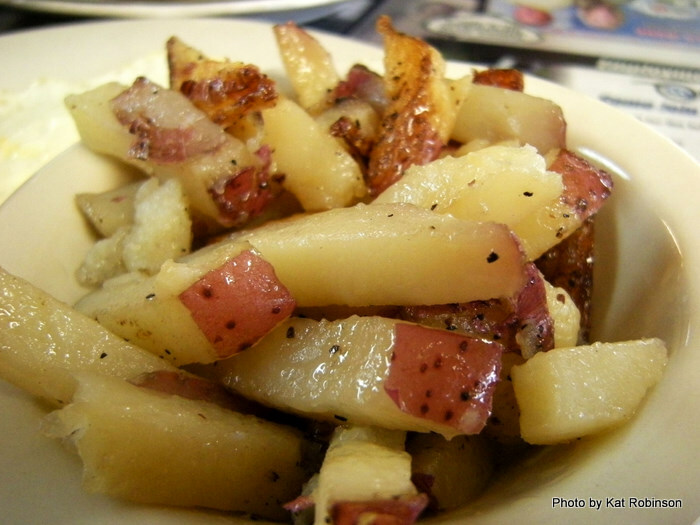 They’re available with any meal, and they’re decadent -- julienne-style red potatoes with black pepper and herbs cooked up in butter. Oh, man. Some of my dining companions have chosen to doctor theirs up with ketchup and the like. I prefer mine as they are. So does Hunter, who has loved getting her hands in them since the first time she had them. 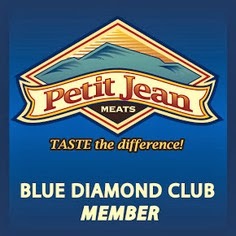 There’s also lunch and dinner -- usually a special every day. I’ve had the Hot Roast Beef before, smothered in brown gravy and served up with fried squash and macaroni and cheese. One thing I can always guarantee when I go to Ed and Kay’s… and that’s a lot of food. Side items that swamp the plate. 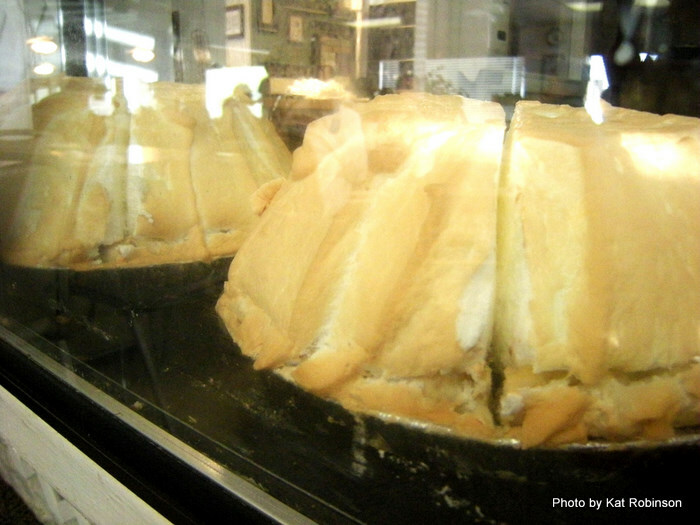 Hot rolls or cornbread with every noontime meal. Generous entrée portions. It’s just good hospitality. I recently went down to the restaurant with my daughter Hunter. That’s right, just me and a 26 month old toddler with a mind of her own. Right after we got there our waitress already had us set up with a cup of milk with a top on it for her, a drinking straw to get her started. One of the kids meal options is a plate with several of the day’s “vegetable” options. 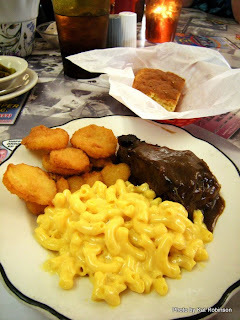 My daughter knoshed on large portions of macaroni and cheese, green beans and those remarkably good fried potatoes. In fact, she had enough for another meal at home left over. 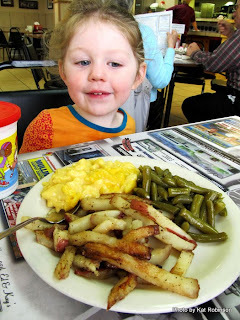 My daughter can eat her weight in fried potatoes… but there’s limits even for her hollow legs. Me? 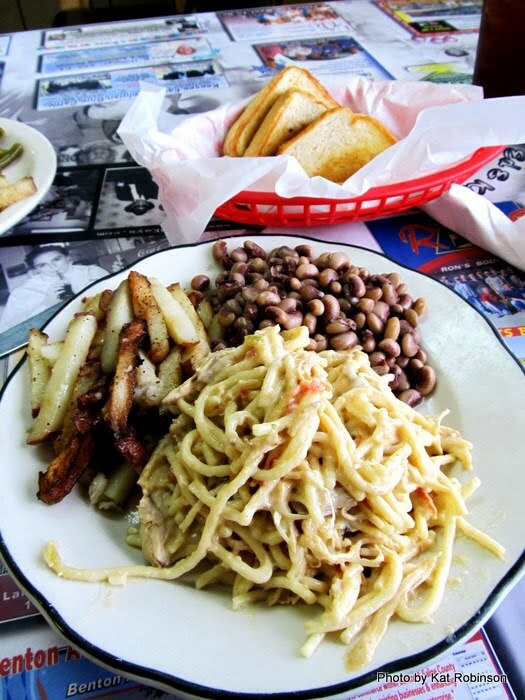 I went for the daily special, the Chicken Spaghetti plate lunch ($7.50), a big pile of creamy chicken spaghetti casserole with some fried potatoes and some PurpleHull peas… an Arkansas staple that doesn’t get its just due outside the state. It was judiciously warm and hearty, the sort of stick-to-your-ribs dinner that stays with you through the afternoon. I ordered up Texas toast -- as much as I like the jalapeno cornbread, the hot rolls and biscuits, my daughter is in a Texas toast sort of mood. And it was good. And this is where I get back to the pie. From time to time Ed’s will run a dinnertime special -- meals after 3pm come with a free slice of pie. Doesn’t matter, I’d have ordered pie anyway. And it wasn’t the Mile High coconut or chocolate I ordered, nor the Lemon Meringue or German Chocolate or Fudge. 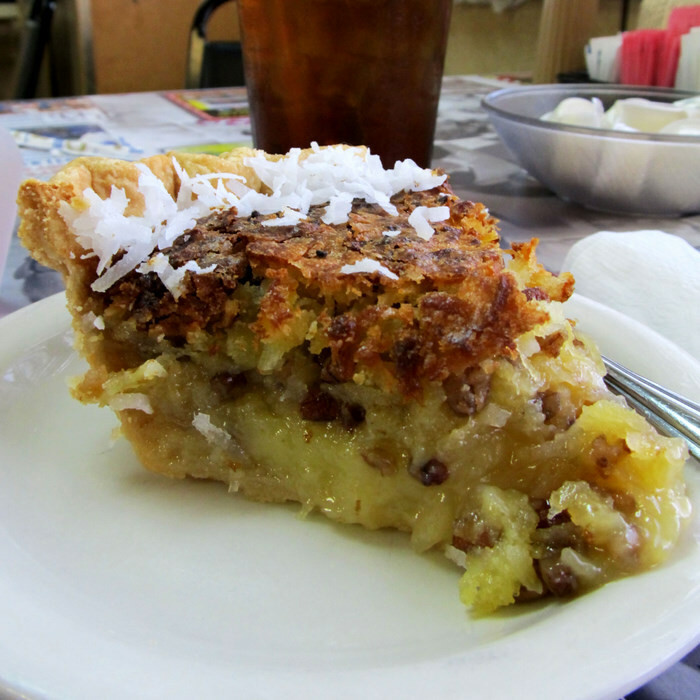 I ordered the PCP -- a pie that’s so good… well. It’s one of the best pies I’ve ever had. It’s pineapple, coconut and pecan. It’s created like a pecan pie but with a pineapple-pecan custard and coconut baked right into the top and crust. It’s a best-of-everything pie, and I can’t recommend it highly enough. A 50 year old diner’s a pretty amazing thing, and if it goes on another 50 years it’ll be even more amazing. I just hope it’s there long enough for Hunter to take her daughter (should she have one) to when she gets to be my age. It’s just one of those Arkansas sort of places you just can’t keep passing up. 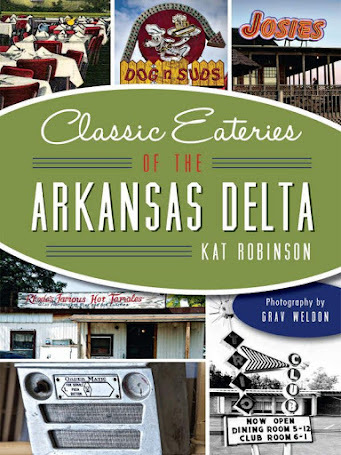 You’ll find Ed and Kay’s Restaurant along the westbound service road on the north side of I-30, west of the Sevier Street exit. They start serving up breakfast at 7:30 each morning, Wednesday through Sunday. Don’t bother going on Monday or Tuesday, they won’t be there. (501) 315-3663. One of our favorites (even better that we're just a few minutes up the road). Service is always awesome, too. Ed and Kay's is definitely a favorite...just down home style and friendliness. Most of the waitresses have been there for years and years. It's not a place where you are offended if they call you "hon." Heh. Well, "vuriakan," I'm sure you'd have plenty of "services" to sell in that regard.